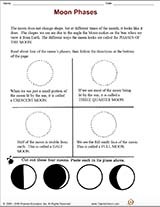 Use a this worksheet to teach your students about the different phases of the moon. 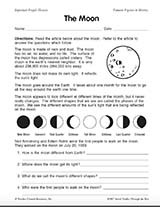 The printable and interactive worksheet explains to students the identifiable traits of each moon phrase. Students will read the descriptions under each blank moon template. They will then cut out the correct moon phase and paste it under the correct description. This is a great resource for students as they study a unit on space and astronomy.